Steve went into Scrooge McDuck mode this weekend and spent a couple of hours pouring over the financial situation on Quicken. Apparently, we've been very good this year and saved a little pile of extra money. What to do with it? We debated about knocking off one of the student loans, putting it a CD, putting it in the market, or buying something. Interest rates are so crappy, and Steve's very pessimistic about the stock market doing anything for a long time. It might be better to knock out debt right now, rather than invest. Steve would love to get one of these, but the pile ain't that big. Question of the Day: If Great Aunt Mabel kicked the bucket and left you $10,000 tomorrow, what would you do with it? a) Pay down the non-subsidized debt we have from when the refrigerator went kablooie on thanksgiving. b) stocks that pay nice dividends (3 or 4 percent) c) get running water to the third floor and more importantly, back down again. If you flushed the toilet up there right now, it would shoot out the side of the house. I would pay down the debt with the highest interest rate. If you flushed the toilet up there right now, it would shoot out the side of the house. If your yard is narrow, you could view that as your neighbor’s problem. First, I’d wipe out a student loan with a current balance of just under $350 – it’s due to be paid off in the next 7 months, but I’d just like to get rid of it (It was a low balance to begin with, and I pay just $45/month). Then, I have credit card debt incurred for necessary medical expenses. $9.5K would knock out more than half of it. Anyway, I’d get new cabinets in the kitchen. So I wouldn’t do anything with it. But, let’s change the question and say, if someone gave you 10K and insisted that you spend it, what would you spend it on. Say you had to spend it all at once, so it couldn’t be, for, say, food. I’d use it to re-decorate a room, using a decorator. I think it’d be my daughter’s room, but it might be the utility room that I’m trying to turn into a studio, or my office at home. What cranberry said. At present, we have drawn on our credit line, which I don’t like to do. If we don’t come up with some extra money soon, we will have to sell stocks to pay it off. So Great Aunt Mabel’s money would be very handy. We haven’t had any debt at all (except monthly credit card bills) for a year or two now. If a dear Aunt Mabel died and left us $10,000, it would go toward our buying a house this spring. There’s nothing else that big that I want right now (although it would be good to get the kids out to see their grandparents on the West Coast more often). My husband actually was supposed to get a small inheritance (of 1 or 2X the size of Aunt Mabel’s bequest) from a relative in Poland a few years ago, but due to a series of legal mistakes by the relative in her estate planning, it all went to her 3rd husband instead. We were hoping to use the money for a house downpayment, so it was very aggravating to be chiseled out of the money, but I suppose it has been good for us to make the downpayment the old-fashioned way. I paid off my student loan for just this reason; the 3-4% interest I was paying was still more than I could make even in a relatively long-term CD. Right now I’m saving money for a house but have no idea where to put it; the savings accounts are at under 1%. I’d get new windows for my house, for sure. Pay off debt (mortgage interest isn’t deductible here) and take the entire family out for a nice meal. You are a woman after my own heart. I have the same car fantasy. Actually, my fantasy can’t decide between a mini-cooper or a Volkswagaon beetle. I would buy a piece of art. According to the TV, you can buy a nice piece of art for $9.99 if you go to the Holiday Inn by the airport next Saturday. I actually had a great aunt Mabel. Her life ended badly. $10k I would put toward any number of needed house projects (new windows, kitchen remodel, repair of the flood-damaged basement). We need to buy landisdad a new, gently used car–his is falling apart. So I’d say it’s probably that, or at least a significant part of that. Knowing me, I’d blow it on clothes. Actually, we get that kind of windfall every summer in the form of summer salary for Mr. Geeky. At first, we squirrel it away, but it inevitably gets spent on vacations. If we planned better, and some years we do, I’d save it for college. I have no idea how college is going to happen. Put it toward the mortgage- my only debt. I’d shove it into the checking account and let it sit there until we’re done with our three upcoming financial unknowns (two 4-5 digit expenses, one 4-5 digit windfall). It’s strange to have so many events in the next two months with predictable dates but unpredictable amounts. Yeah, I hate that. I wouldn’t actually blow it on clothes (I don’t think). But, I can imagine frittering it away, rather than committing to buying one big thing. Somehow it’s easier to buy 8 pillows than one desk (my most recent purchase, even though I’m supposed to be buying a desk). But, I do need the pillows. 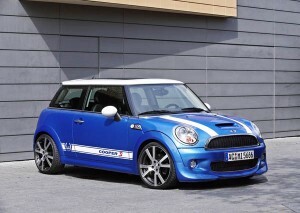 I think I’m going to get a mini cooper as soon as my older child is old/big enough to ride in the front seat. I always wanted one of those 2 seater MG’s, but I think the mini cooper will do. PS: Laura — you’re a good tweeter. I refuse to tweet or follow tweets, but I like reading your tweets on your blog. I would buy health insurance for years for my family. When this happened for me, I killed my student loans. And when it happened again, we killed our mortgage. We are too stupid and inattentive to follow the market, and the ‘return’ of interest we didn’t have to pay is guaranteed. This will probably result in colleges thinking we can pay more, when the kids get to college – but, in fact, we can. So, it worked for us.